A BBC history TV series, Tales from the Green Valley, explores life on a British farm in the 17th century. This 12 x 1/2 hour television documentary, produced and directed by Peter Sommer, was awarded the prestigious Learning on Screen award by the British Universities Film and Video Council for its rich historical and educational content. This article about the series was first published in the October issue of Retirement Today magazine. Why make a TV series about life on a 400 year old farm? That was my first question, when I was asked to direct and produce a 12-part BBC series, Tales from the Green Valley, about five specialists working a Welsh hill farm as it would have been in the 17th century. I have to admit I was rather sceptical of the idea. Not only did it mean uprooting my family and moving to Wales for a year, but more than that, I was concerned that it might turn into just another low grade reality show, in which the historical concept would be relegated to a back seat. There’s been a slew of programmes where an average family or group of people are dropped into an alien environment – the past – wrapped in period clothing, and shorn of modern luxuries and facilities. Occasionally they are insightful, but much of their time dwells on the personal, the arguments between ‘contestants’ and above all the sensational. I wanted to try and make something very different – a series that was beautiful to watch, and most important of all, informative. Instead of using just people off the street, we wanted our team of period farmers to be experts, specialists in differing fields. The aim was to take their learned knowledge and apply it, to try and turn theory into practice. So we assembled our experts – Stuart Peachey, a farming and food historian, Ruth Goodman, a social historian and clothing specialist, Alex Langlands and Peter Fonz Ginn, two young, strong, and above all practical archaeologists, and Chloe Spencer, an archaeologist experienced at working with animals. We launched into filming in September, the start of the agricultural calendar, with twelve months of farming on the horizon. But what to film? For much of the year this question was answered for me, because the schedule of farm activities is almost pre-ordained. The farmer’s yearly, monthly, and near enough daily tasks are virtually set in stone, dictated by the weather, the soil, and the basic cycle of life. From the outset this was one of the most significant lessons that hit home to our specialists. Of course they had some room to choose what to do and when. Some months, like January in the depth of winter, are relatively quiet times, with no urgent tasks to grapple with. A time like this is a welcome respite for the farmer allowing him to catch up on repairs, maintenance, and take a breather before the onslaught of spring. The rest of the time, big events are laid out like a series of milestones: from the September ploughing and sowing, and fruit harvest in October, to sheep shearing in June, and making hay while the sun shines in July. As I planned our filming schedule, the main agricultural tasks were pretty obvious, but one area I hadn’t particularly considered in terms of farming activities was construction. In fact a number of building projects came up during the year, from putting up a hovel (a wood store), to replacing the privy damaged by February storms. One of the first major tasks the experts had to deal with, was to put up a cowshed using only tools, technology, and materials available in the year 1620. To put things in context, this was a time when the pilgrims were setting sail for America, and James I was sitting on the throne, just a few decades before the civil war tore England apart. Not only that, but the farmer needed to be steeped in his local environment. While most of us today travel through the countryside simply admiring its rural beauty and charms, the period farmer saw it through very different glasses. To him the surrounding landscape was like a giant larder and tool-box full of valuable resources, all with their own qualities and uses, from different woods to plants with medical properties. From father to son, such inherent ‘bush craft’ knowledge was passed on and learned – what could be useful, how it should be managed, and when it should be collected. I remember the time when Alex was working on the cowshed roof. He’d excavated similar buildings from the period, but it was only when handling the materials, slotting bendy hazel rods through the roof beams to create a mesh for the thatch, that he gradually appreciated the various properties and so potential of his tool-kit. Back in the 17th century, wood was a resource of paramount importance. It was used to such a degree, from making charcoal to shipbuilding, that it’s reckoned there was half as much tree coverage then in Britain as there is today. Faced with such an appetite, timber itself was cultivated, with most farms of any size having their own coppice, an area of woodland meticulously managed with an outlook stretching decades if not centuries into the future. When we harvested wood from the farm’s coppice, it was like walking through a giant DIY store, ready prepared, and easily labelled if you knew what you were looking at. Different species of tree, of varying sizes from young saplings to giant oaks, were grown to provide rods and beams in a range of thicknesses and lengths. Whatever type of wood was required, from making pegs, building a table, or replacing a roof timber, they were all ready at hand. It was an area of farming I hadn’t even thought of before I set to work on Tales from the Green Valley. Needless to say a farm’s ultimate reason for being is food. Four hundred years ago, devoid of electricity, people had to find other ways of preserving food as long as possible without refrigeration. Of course it’s still done in traditional ways today, in many places out of necessity and in other cases because the curing process adds to the taste – like Parma hams hung for years at a time, smoked kippers, or vegetables pickled in vinegar. But it’s one thing to relish your favourite salami, another thing altogether to actually see how it’s made. From the moment we killed one of the farm’s pigs, a food clock was ticking. First, the blood had to be drained and used, next the offal had to be consumed, only then could attention turn to the rest of the pig. It was commonly said, that the only part of a pig not devoured was its squeak. Certainly nothing went to waste. Back then food squeamishness was an unheard of luxury. But it’s not a simple and straightforward job processing a whole animal from start to finish, especially for people used to buying their bacon ready-sliced and wrapped in cling film. It’s a time consuming but in many ways fun and celebratory task, as it remains in many countries, where whole families gather to kill and process one of their beasts. It really is all hands to the pump. Just getting the bristles off Arthur the pig, a wild boar-tamworth cross, about the closest we can get to the breed of the time, was a major undertaking. These pigs are incredibly docile and friendly, but they’re also incredibly hairy, as they needed to be, living out in the woods a significant amount of time. Today, the thin bristles on our almost bald pigs are boiled off in great vats, but back then farmers put another technique into play – a pig bonfire. They couldn’t burn it too long or it would start to cook the carcass, but it had to be just enough to singe off the hairs. De-haired, the soot then had to be scrubbed off, only then was the skin clean enough so salt could be applied in liberal quantities to cure it. In our modern world, where processed food is all around, it’s refreshing to take a step back, remember where food really comes from, and appreciate the sheer amount of time needed to make things ready for eating by hand, from plucking a chicken and winnowing wheat, to podding peas. The proof of the pudding is in the eating, and I have to say that Arthur’s pork chops were perhaps the most succulent and tasty I’ve ever tried. One other highlight on the food front were the apples. These days when we check out the fruit section of a supermarket we might come across half a dozen varieties, bred to look pretty and last well. The orchards on our reconstructed 400 year old farm, were laden with apples I’d heard of but never seen, from Cornish Aromatics to Costards for cooking. The autumn glut couldn’t all be consumed at once so they were stored upstairs in the farmhouse, in an ‘apple loft’, where it was cool and airy. They had to be turned on a regular basis, and checked for any that had gone bad, but the vast majority survived in excellent crisp condition for six months – a good source of vitamins through the winter until spring arrived. While shop bought apples often seem to go off in just a few weeks these days, it was rather shocking to eat apples in March that we had picked the previous September, without a refrigerator in sight. Standing behind the camera it was fascinating to see the experts adjust so easily to a very different pace of life, and immerse themselves in tasks not seen in Britain for centuries. Throughout the year they were joined by a whole host of traditional craftsmen, bringing in additional skills, many of them on the point of disappearing in this country. Until a professional candle maker came to help the team I had no idea that the majority of candles in a farm at the time would have been made from sheep fat. Before a master thatcher arrived on set with a 400 year old length of straw rope and a ‘wimble’ that was used for turning it, I would never have believed you could make strong rope out of something as lightweight as straw. Until a charcoal burner came to assist the team, I would never have guessed how slow and complicated is the process of turning timber into something as vital as charcoal. It’s easy to look back at such a rural idyll with rose tinted glasses. In our busy, forever switched on lives, it’s easy to dream of a way of life that seems uncomplicated, slower, and more down to earth. It’s all too simple to forget the terrible diseases and low life expectancy, the physical exhaustion of manual labour, or the desperation and hunger when a farm was in trouble. Making this documentary series was one long learning curve for me. No longer do I have any illusions about how much better it was in ‘the good old days’. I do quite like the idea of drinking just beer, up to eight pints a day apparently, since most people didn’t have access to clean water, and fermented beer is safe to drink. I do fancy the almost spiritual satisfaction that comes from spending a whole day working out in the fields, and coming in exhausted to find a hearty dinner on the table. But having seen Ruth and Chloe doing the laundry 17th century style, making their own washing liquid ‘lye’ from ashes in the fire, using stored up urine to remove stubborn stains, and then bashing the lot out on the rocks in a stream, I certainly wouldn’t want to turn back the clock and give up my washing machine. If you would like to know more about the series, please see Tales from the Green Valley or read another article. If you have any questions – please contact us. 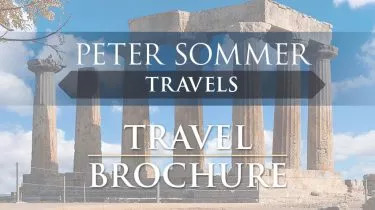 Peter personally leads a number of our escorted tours in Turkey each year. each year, he is also sometimes available to guide private tours. Back to About Peter Sommer.